According to an article in the Palm Beach Post, smokers who fail to quit could potentially be kicked out of the Medicaid program if legislation being proposed by State Senator Joe Negron (R-Stuart) is enacted. According to the article: "Sen. Joe Negron wants fat Floridians and smokers to get healthy or else. Included in Negron’s revamp of the state-federal Medicaid program – which Negron will release tomorrow – is a component aimed at what senators are calling “personal responsibility.” Sen. Don Gaetz, a Niceville Republican who helped craft Negron’s bill, said Medicaid patients have to take control of their health care just as he had to do when his doctor told him to lose weight. “We’re saying that an individual who’s been diagnosed as morbidly obese needs to be on a medically-directed program of weight loss to manage that health care problem that could turn into an increased taxpayer liability. The same thing with smokers,” Gaetz said." "The bill would require smokers and alcoholics and drug addicts to get treatment, Gaetz said. Negron said his bill would include incentives for Medicaid patients to lose weight, quit smoking and stop drinking but did not give details about what they would be. If they don’t get thinner and put down the smokes, Negron said their coverage could be cut off." The introduction of this legislation in Florida, on the heels of a similar bill that has been proposed in Maine, suggests that we are seeing what soon may become a new trend: discriminating against smokers in health insurance coverage in order to save health care costs. Of course, the premise behind the legislation is flawed in the first place because not even smokers can be denied medical treatment if they show up in an emergency room with a heart attack or stroke. The state is going to have to pay for it anyway because the individual lacks health insurance. The issue is simply whether the funding comes out of the free care pool or the Medicaid pool. But with that aside, this legislation violates the very premise of medical care: that physicians and hospitals treat everyone, regardless of the reasons why they became ill. Even prisoners of war are provided with medical treatment. So are prisoners who have committed felonies. Are Senators Negron and Gaetz saying that smokers deserve fewer rights than prisoners? Once we begin to make health insurance coverage dependent upon lifestyle decisions - even unhealthy ones - we have entered the ugly territory of bigotry in medical treatment. Do we really want lifestyle to be a criterion for determining eligibility for public health insurance? And why just pick on smokers? What about people who do not wear seat belts? Those who forget to put on sunscreen? People who eat out at Burger King five days a week? The Victoria chapter of the Australian Medical Association (AMA Victoria) has publicly claimed that electronic cigarettes can cause coronary atherosclerosis (hardening of the arteries supplying blood to the heart), heart attacks, and strokes, according to an article in the Victoria Herald Sun. According to the article, the president of AMA Victoria stated: "If you're addicted to e-cigarettes, you go to a milk bar and they don't have them, but they do have normal ones. These e-cigarettes mightn't give you lung cancer, but they can lead to stroke, heart attacks and coronary heart disease." I challenge AMA Victoria to provide the evidence that supports its contention that electronic cigarettes can cause strokes, heart attacks, and coronary artery disease among users. To the best of my knowledge, there is no such evidence. Moreover, if it is true that electronic cigarettes can cause heart disease, heart attacks, and strokes, then so can nicotine replacement products like the nicotine patch and nicotine gum, which deliver as much or more nicotine than electronic cigarettes. Why is AMA Victoria not also warning the public about the risks of nicotine replacement therapy? If I am correct and there is no evidence that electronic cigarette use increases the risk for heart disease, heart attacks, and stroke, then why is AMA Victoria making this up? The answer, I believe, is ideology. Groups like AMA Victoria and other anti-smoking organizations simply cannot tolerate the idea that something which looks like smoking could possibly have health value. Ironically, they feel this way even if that health value is ridding oneself of the serious health risks associated with cigarette smoking. The rest of the story is that it appears that AMA Victoria is simply making up the claim that electronic cigarettes can cause heart disease, heart attacks, and strokes in order to prevent people from thinking that using a product which looks like a cigarette could possibly have health advantages. Unfortunately, the impact of this unsupported claim is likely to do immense damage to the public's health, by convincing many smokers not to quit smoking using electronic cigarettes and by causing some ex-smokers to return to smoking because of fear over possible health damage from the e-cigarettes they are using successfully to stay off tobacco cigarettes. Given that physicians, and physician organizations, are supposed to first, do no harm, it is disappointing to see AMA Victoria causing this kind of harm, especially when it is based on a completely non-scientific claim. Today, the Rest of the Story is issuing a challenge to hospitals which have adopted smoker-free hiring policies: extend your policy to include physicians and then we will take note of your setting a positive example for your patients. Otherwise, get off your high horse and stop boasting about how you are modeling healthy behavior for the population. It is easy for hospitals to tell nurses, cafeteria staff, custodial staff, and administrative staff that they will not be hired if they smoke. But the physicians and surgeons are the ones who are actually treating the patients. If they are smokers, then the hospital's claim about setting a good example and modeling healthy behavior goes down the tubes. Most physicians are not covered by existing hospital smoker-free hiring policies because the physicians are not hired directly by the hospitals. This means that current smoker-free hiring policies are pure window dressing. I think it's time to find out whether these hospitals really are willing to stand up for what they claim to be a principled stand. So today, I challenge these hospitals to extend their smoker-free policies to include treating physicians in their hospitals. Test all physicians for cotinine and revoke treating privileges for those who test positive, otherwise cease and desist from boasting about how you are standing up to promote a healthy workforce and a healthy community. Allowing physician and surgeon smokers to work in a hospital but not nurses or other staff who smoke is an example of classist bigotry. Surely these hospitals do not want to continue to make such a distinction. This challenge is a great opportunity for these health care institutions to eliminate this classist bigotry and to make it clear that they really do stand for the principle of setting a good example for their patients and promoting a healthy workforce and a healthy community. Today's front-page article in the New York Times highlights the recent trend of employers refusing to hire anyone who uses tobacco products. This is especially common among hospitals and health care systems. It is very nice to see the American Legacy Foundation speaking out against this form of employment discrimination. According to an article on the web site of the Des Moines NBC television affiliate (WHO), University of Iowa researchers are claiming that the statewide smoking ban has had a dramatic effect on the incidence of heart disease, heart attacks, and strokes. According to the article: "The University of Iowa says in the two years Iowa has been smoke free, Iowans reduced their risk of heart disease by staggering numbers. 'Hospital admissions related to heart disease is much less, including stroke after the Smoke Free Air Act,' says Dr. Enrico Martin of the Iowa Heart Center. Admissions have gone down 24%, according to the University of Iowa. In just months, heart attack cases are down 8%. Strokes are down 5%. It's all thanks to the simple action of moving smokers outside." Before even evaluating the actual data, there are two notes of caution that are important. First, there does not appear to be any actual study. This appears to be yet another example of "science by press release." This is dangerous because if the conclusions turn out to be invalidated, it is too late to change the news. It is already out there. In fact, this story has been reported widely in the media. There is little opportunity for scrutiny of the study's findings because so far as I can tell, the methods are not publicly available. Second, there does not appear to be any control group. The statistics being cited are simply declines in cardiovascular disease rates. Since these rates were already declining prior to the smoking ban, these statistics do not actually provide evidence that the smoking ban had any effect on cardiovascular disease rates. In fact, heart attack declines of 8% and stroke declines of 5% since the smoking ban do not appear to be much different from what one would expect in the absence of a smoking ban, given secular trends in these diseases. Fortunately, we can objectively evaluate the researchers' claims by examining the actual data. Data on cardiovascular disease death rates in Iowa are available from the Iowa Department of Public Health web site. The statewide smoking ban in Iowa went into effect on July 1, 2008. Here are the trends in heart attack death rates and stroke death rates in Iowa from 1999 through 2009. The smoking ban implementation is shown in each figure. 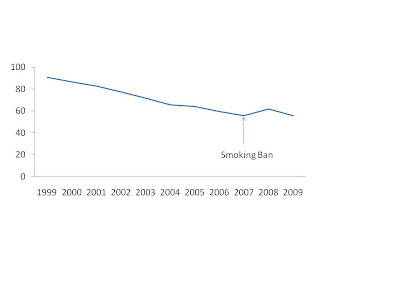 If the smoking ban had a significant effect on heart attacks or strokes, one would expect to see a substantial decline in these rates during the years 2008 and 2009. These data demonstrate that the smoking ban clearly had no substantial effect on death rates for either heart attacks or stroke. 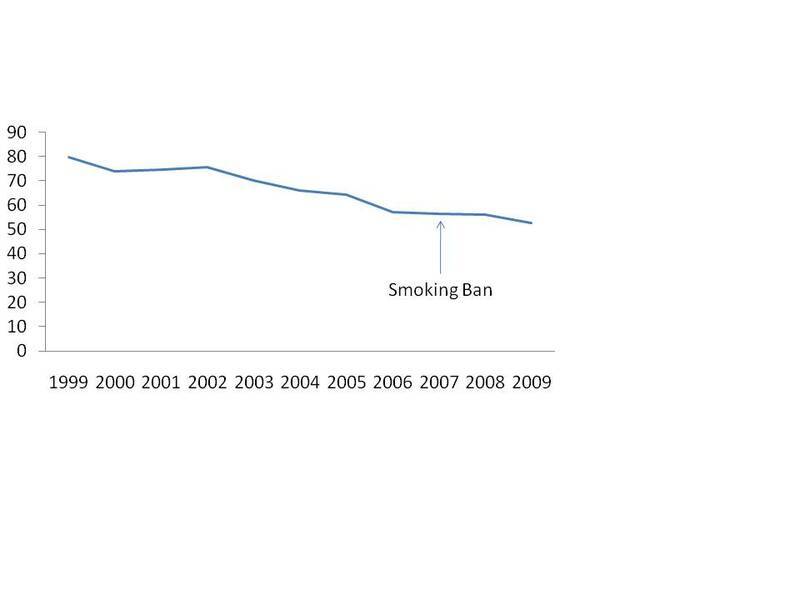 Figure 1 shows that if anything, the smoking ban was associated with an increase in the expected rates of heart attack death in Iowa. 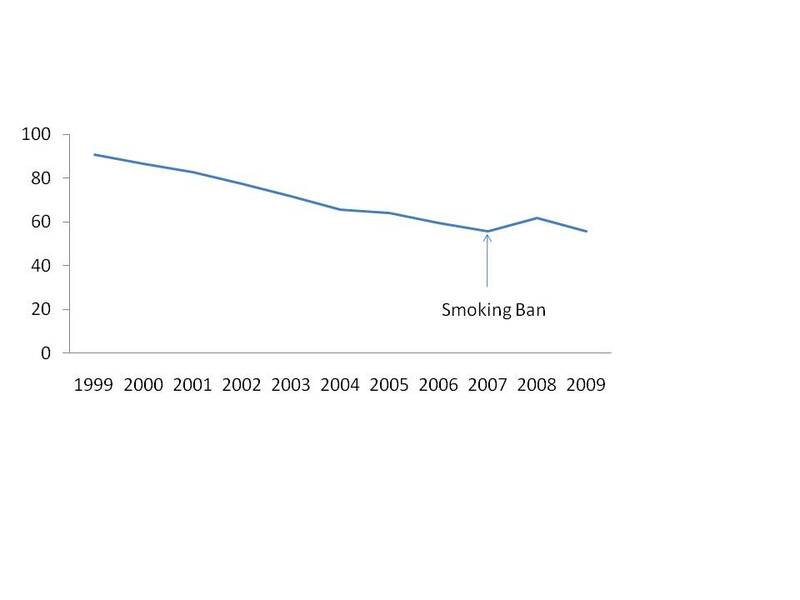 There was a slight increase in the heart attack death rate during the first year of the smoking ban's implementation, despite a trend of declining heart attacks prior to that. 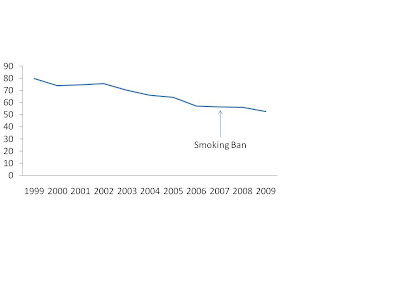 Figure 2 shows that if anything, the existing rate of decline in stroke deaths in Iowa slowed after implementation of the smoking ban. In the eight years prior to the smoking ban, the stroke death rate in Iowa declined by an average of 3.8% per year. Since the smoking ban, the stroke death rate has declined by an average of only 3.2% per year. Clearly, I am not arguing that the smoking ban has resulted in an increase in the expected number of heart attack and stroke deaths in Iowa. What I am arguing is that the conclusions of these Iowa researchers are invalid, as they are simply not supported by the data. As is the case with most of the smoking ban - heart attack studies, these researchers are engaging in wishful thinking in the absence of rigorous scientific analysis. Once again, it appears that they are using data to try to support a pre-determined conclusion, rather than objectively examining the data. Will these researchers, and will anti-smoking groups, acknowledge that based on these data for trends in heart attack and stroke deaths in Iowa, the smoking ban has had no effect on either? I doubt it. Because the anti-smoking groups are not interested in the truth. They are interested in disseminating pieces of data that support their pre-determined conclusions. A new study being published online ahead of print today in the American Journal of Preventive Medicine reports that electronic cigarettes are a promising tool to help smokers quit, producing six-month abstinence rates that are better than those for traditional nicotine replacement products (NRT). In a six-month follow-up survey of 222 first-time purchasers of electronic cigarettes, researchers from the Boston University School of Public Health found that 31.0% of respondents reported having quit smoking. This compares favorably to an average six-month abstinence rate of between 12% and 18% for NRT products. The authors conclude that electronic cigarettes are a promising method for smoking cessation. The study was led by Dr. Michael Siegel, Professor in the Department of Community Health Sciences at the Boston University School of Public Health. 31.0% of the respondents reported having quit smoking at six-month follow-up. Of those who had quit smoking, 34.3% had discontinued the use of electronic cigarettes as well. 66.8% of respondents reported having reduced the number of cigarettes they smoked after using electronic cigarettes. 48.8% of respondents reported having quit smoking for a period of time after using electronic cigarettes. Among respondents using electronic cigarettes frequently (more than 20 times per day), the six-month smoking abstinence rate was 70.0%. Co-authors of the study were Kerry L. Tanwar and Kathleen S. Wood, also of the Boston University School of Public Health. The press release about the study issued by the Boston University School of Public Health can be found here. I think there are several important findings from the study that should be emphasized. First, although the response rate was low, there is no particular reason to believe that smokers who quit were more likely to respond. The respondents were not told that this survey was about electronic cigarettes. They were told only that it was a survey about smoking experiences. Although it is possible that smokers who quit were more likely to respond, we do not have any particular reason to believe that was the case. Nevertheless, the results should be viewed as preliminary and further examination of this research question using more rigorous research designs is clearly warranted. Second, regardless of the ultimate quit rates, the study suggests that electronic cigarettes are effective in helping smokers reduce the amount they smoke and at least temporarily quit smoking. This is critical because even reducing the amount smoked has a profound effect on health risk (despite the propaganda of the Surgeon General's office). Third, the study suggests that electronic cigarettes may actually be more effective than traditional nicotine replacement therapy. I believe the reason for this is that these products address both the pharmacologic and behavioral aspects of smoking addiction. The fact that vaping looks like smoking is precisely the fact which drives the anti-smoking groups crazy, but it is also the fact which makes electronic cigarettes so promising as a smoking cessation tool. Fourth, the study suggests that people who use electronic cigarettes more frequently are more successful in quitting smoking. This is important because it means that if public education campaigns were to instruct people on the proper use of the product, it could be even more effective than it already is. In other words, if anti-smoking groups and the FDA embraced electronic cigarettes as a smoking cessation method rather than working to ban the product, it could become an even more effective smoking cessation tool. Finally, while there is widespread speculation that people who use electronic cigarettes are only substituting one addiction for another, our study found that one-third of customers who quit smoking using electronic cigarettes were actually nicotine-free at six months after first purchase of the product. Nevertheless, it is important to point out that even if people who quit smoking using e-cigarettes continue to use these devices, they are still ex-smokers. They have quit smoking successfully and will reap enormous health benefits. According to the thinking of anti-smoking advocates in Washington state, it is unacceptable for tobacco companies to sell a menthol-flavored cigarillo because such a product might lead youth to a lifetime of addiction; however, it is perfectly acceptable for tobacco companies to sell menthol-flavored cigarettes. Washington legislators have introduced, and anti-smoking groups are supporting, legislation which would ban the sale of menthol cigarillos in Washington but continue to allow the sale of menthol cigarettes. The reason for the legislation? According to an article in the Seattle Times, flavored cigarillos must be banned because they are a "gateway to long-term tobacco use." According to the article: "Public-health officials maintained that the brightly colored, flavored products start teens down a dark road to lifetime nicotine addiction. ... Dr. David Fleming, director of Public Health — Seattle & King County, said the products — such as Swisher Sweets cigarillos in peach, white grape and strawberry flavors — are essentially a 'gateway to long-term tobacco use.'" The bill - House Bill 1246 - would ban all flavored tobacco products, including cigars, cigarillos, and smokeless tobacco, but with the exception of cigarettes. In the ultimate example of the hypocrisy of anti-smoking advocates who are supporting this legislation, the bill first bans all flavored tobacco products. Then, in small print at the end of the bill, it defines tobacco products as all tobacco-containing products with the exception of cigarettes. The fact that this bill needs to go to the ridiculous extreme of defining a cigarette as not being a tobacco product tells you everything you need to know about how hypocritical the bill's supporters are. Somehow, it is unacceptable to sell flavored cigarillos - despite the very low prevalence of their use among youth - because they may lead to lifetime addiction to tobacco products, but it is entirely acceptable to sell flavored (menthol) cigarettes which are introducing literally thousands of Washington youth to a lifetime of addiction to cigarettes. This is the first time I have ever seen cigarettes defined as not being tobacco products. It defies common sense. But that defiance of common sense shows the extremes necessary to make this bill sound like a coherent approach to tobacco control. The rest of the story is that the supporters of this legislation are looking for an easy political victory that will make them feel and look good, but without having to actually stand up to the tobacco industry and without having to actually craft a tobacco control strategy that will lead to substantial reductions in tobacco use and addiction. It is a great example of hypocrisy in the anti-smoking movement. It is also a great example of political cowardice. I hope not only that the bill goes to defeat, but that the legislation is publicly exposed for its political, rather than purely public health objectives. Hopefully this column will start that process. The Canadian Cancer Society has called for all provinces to ban smoking in cars carrying children ages 17 and younger. According to an article in the Calgary Herald, Ashley Jensen, the cancer society's regional community engagement co-ordinator stated: "It's unfortunate to see Alberta falling behind on tobacco when even our neighbours, B.C. and Saskatchewan, have moved forward with legislation. This is about protecting kids from preventable death, disease and disability." According to the article: "Alberta is lagging when it comes to discouraging cigarette smoking in vehicles carrying children, says the Canadian Cancer Society. All provinces have laws prohibiting smoking in public places. However, only six provinces and the Yukon territory have legislation banning smoking in vehicles with children. Alberta is among four provinces and two territories that haven't made it illegal for drivers to smoke in vehicles carrying children under the age of 18. ... The Canadian Cancer Society says children exposed to tobacco smoke face an increased risk of sudden infant death syndrome, acute respiratory infection, middle ear disease and an increased severity of asthma. ... Two Alberta communities have bylaws against smoking in vehicles with kids. Okotoks passed its legislation in 2008, and Leduc's bylaw takes effect in July. Leduc Mayor Greg Krischke said the cancer society sparked the regulation change during a Federation of Canadian Municipalities conference last year in Toronto." If the Canadian Cancer Society means what it is saying and believes that as a principle, the government must intervene to protect children from exposure to secondhand smoke caused by their own parents, then why is it promoting a ban on smoking in cars, but not in homes where the overwhelming majority of infant and childhood secondhand smoke exposure occurs? If banning parents from smoking in their own cars is necessary to protect infants and children from dying due to SIDS or from developing asthma and lower respiratory tract infections, then what possible justification is there for allowing these same infants and children to be exposed to secondhand smoke in the home? It seems to me that this is a hypocritical stand by the Canadian Cancer Society. It is fine, their position infers, for parents to smoke around their kids in the home. It is only in cars that secondhand smoke is a problem. By what law of nature does secondhand smoke in cars affect the health of children, but secondhand smoke in the home present no health risks? The position of the Canadian Cancer Society is not only unsupported by science, but it is also an example of the political cowardice that afflicts the modern-day tobacco control movement. The Cancer Society is allowing politics to influence its position on issues of science and health, in contrast to its public statements which imply that health is the only legitimate concern here. In other words, the Canadian Cancer Society is full of hypocrisy. They are criticizing others for putting politics above health and science, yet they are doing precisely the same thing in not calling for a ban on smoking in homes with children. As I've made clear before, my own position is that while secondhand smoke is a significant health risk for infants and children and it is quite unfortunate that many children are exposed, it is simply not justified for the government to interfere with parental autonomy by banning smoking in private homes and cars to protect kids from their parents' behavioral decisions. I fully support interventions to reduce childhood exposure to secondhand smoke, but these should rely on education and health communication campaigns, not state coercion. But regardless of one's position on the issue, the point of this commentary is simply that the Canadian Cancer Society, like its counterpart in the U.S., is full of hypocrisy. They are criticizing others for considering concerns other than health and science, yet they are doing precisely the same thing. At this point, I'd settle for a principled stand on either side of the issue. Either opine that the government has a legitimate justification to interfere with parental autonomy and privacy to protect kids from health risks and support a ban on all smoking in the presence of children or declare that the government is not justified in such a usurpation of parental autonomy. But don't pretend to be standing up for a principle when in fact, you are violating the very principle for which you claim to be standing up. Anti-Smoking Groups Want Electronic Cigarettes Off the Market Because They Have Not Been Proven Safe; What About Chantix? The major national anti-smoking groups, including the Campaign for Tobacco-Free Kids, American Heart Association, American Lung Association, American Cancer Society, Action on Smoking and Health, American Academy of Pediatrics, and the American Legacy Foundation, have called for an immediate ban on electronic cigarettes because they claim we are not sure whether these products are safe for use as smoking cessation devices. In the mean time, new evidence published in January demonstrates that Chantix is most definitely not a safe drug. However, none of these same anti-smoking groups is calling for Chantix to be pulled off the market until it is proven to be safe for use as a smoking cessation drug. A new study published last month in PLoS One reports that Chantix is the worst drug offender in terms of being associated with suicidal behavior and violence towards others. According to the research, Chantix has been associated with more than 400 cases of violence and more than 11,000 serious adverse effects. Chantix was associated with 18 times the number of violence cases as one would have expected by chance. The study controlled for the possible increased tendency towards aggression among the population being treated with Chantix and the relationship between varenicline use and violence was still enormous. Thus, these effects seem to be a real side effect of Chantix use. The article concludes: "Acts of violence towards others are a genuine and serious adverse drug event associated with a relatively small group of drugs. Varenicline, which increases the availability of dopamine, and antidepressants with serotonergic effects were the most strongly and consistently implicated drugs." This research has led some to conclude that: "the message is clear that while Chantix can prove to be an effective weapon for chronic quitters (smokers who try various magic bullets to kick the habit, only to fail…), the costs to some in terms of Chantix aggression and other Chantix side effects can be potentially devastating." If, as the anti-smoking groups argue, drugs should be proven to be safe before being allowed on the market for use in smoking cessation, then why aren't these groups demanding that Chantix be immediately removed from the market? While electronic cigarettes are not known to have any serious adverse side effects, Chantix has been demonstrated to have the most serious possible adverse side effect: death. If electronic cigarettes need to be removed from the market just on the off-chance that they may have serious side effects, then shouldn't Chantix absolutely be withdrawn from the market since we know that it is currently causing thousands of serious adverse effects? Perhaps the reason has something to do with the fact that all of these anti-smoking groups receives or has received funding from pharmaceutical companies that manufacture smoking cessation drugs (like Chantix) and which may be threatened by the continued sale of electronic cigarettes, which appear to be more effective for smoking cessation than these traditional products. This money is apparently very well spent. These anti-smoking groups are not biting the hand that feeds them. Despite the fact that it violates the very principles these groups have set out, they are not calling for the removal from the market of Pfizer's drug, even though it is clearly not a safe treatment for smoking cessation and even though they have called for the removal of a potential competitor - electronic cigarettes - from the market in the absence of any demonstration of harm from these devices. To be clear, I am not arguing that Chantix should be removed from the market. I am only pointing out that the actions of the anti-smoking groups are inconsistent and hypocritical and that the obvious source of this hypocrisy is money: money from Pfizer. Now you know why corporations are so anxious to donate money to health groups. It buys their silence at important times like this. The savings in corporate profits is well worth the donation. According to an article in Discovery News, yet another electronic cigarette opponent is unsure whether smoking cigarettes is any more dangerous than using electronic cigarettes, even though the latter does not contain any tobacco, nor is there any smoke or combustion of any tobacco. According to the article: "As the U.S. Food and Drug Administration struggles to gain regulatory control, and as safety studies remain works in progress, the debate continues. 'There really are a lot of unknowns with respect to health,' said Prue Talbot, a toxicologist at the University California, Riverside. 'I don't know of any studies in the literature which are peer-reviewed. Almost all of the studies have been paid for by the e-cigarette companies. E-cigarettes are often sold as safe, which is probably not true,' Talbot added. 'They may not be as dangerous as real cigarettes, but on the other hand, they could be. We just don't know.'" While I agree that electronic cigarettes are not "safe" in absolute terms, there is little question that they are much safer than smoking tobacco cigarettes. The contention that nicotine plus tens of thousands of other chemicals including 60 known carcinogens is more dangerous than nicotine vaporized from a propylene glycol/glycerin solution does not require rocket science. Only a tobacco company would claim that it is uncertain whether smoking is any more dangerous than inhaling nicotine from a relatively clean solution of propylene glycol and glycerin. Check that. A tobacco company would not say that. Only electronic cigarette opponents are making that claim. The evidence simply does not support the claim. While cigarette smoke contains more than 60 carcinogens at relatively high levels, there have been only two carcinogens found in electronic cigarettes and they are present only at trace levels. In fact, the levels of these two carcinogens (which are present because the nicotine is extracted from tobacco) is more than 1,000 times lower than that of the same carcinogens in tobacco cigarettes. Moreover, there are 16 laboratory studies of the constituents of electronic cigarettes and none have identified any chemicals at levels which would warrant serious concern. How can researchers like this go out publicly and state that there is no evidence that electronic cigarettes are any safer than what we already know is the most dangerous and toxic consumer product on the market, which we know kills hundreds of thousands of Americans each year? Why are these researchers ignoring the available data which clearly show that the levels of carcinogens in electronic cigarettes are orders of magnitude lower than in regular cigarettes? Unfortunately, there appears to be a very strong bias operating which does not allow anti-smoking researchers to objectively view the scientific evidence on electronic cigarettes. I believe that the very fact that these devices are similar to cigarettes blinds many anti-smoking researchers to the actual scientific evidence that is readily available. It is apparently not the documented hazards of vaping which are troubling the anti-smoking movement, but the fact that it looks like smoking. How can anything which looks like smoking be a good thing, even if there is strong evidence that these products are bringing immense and immediate health benefits to thousands of users? There simply is no room for this in the anti-smoking movement's mentality. A group of 37 Missouri hospitals had their first day in court yesterday in a lawsuit against the tobacco companies (City of St. Louis v. American Tobacco). The suit seeks $477 million in compensation for the treatment of smoking-related illnesses among patients who did not have medical insurance. The claims date back to 1993. "Diane Sullivan, a lawyer for Philip Morris, argued that 95 percent of all patients paid their hospital bills and that only one of every five others smoked. "The truth is, hospitals make money from our bad habits," she said. Sullivan predicted that the plaintiffs would do their best to get jurors angry at tobacco companies. But she said that hospitals have mounted advertising campaigns to get smokers to use their hospitals, have allowed smoking on their campuses, and have sold cigarettes in vending machines and gift shops." Although I agree that cigarette companies produce a deadly and addictive product, that they have historically lied about the health effects of the product, that they knew the product was addictive and harmful yet covered that information up, and that they continue to manufacture and market this deadly product, I do not believe that the Missouri hospitals are entitled to compensation from the tobacco companies for treatment of smoking-related illnesses. compensation from pharmaceutical companies for treatment of illnesses related to side effects of medications. I think you get the idea. Allowing hospitals to be compensated for treatment of smoking-related illnesses would open the flood gates for similar lawsuits to be brought against all sorts of manufacturers of products which cause human illness. Although I am obviously sympathetic to the desire to hold tobacco companies accountable for their actions, I do not believe that this case has any legal merit. What disturbs me about the case, however, is the fact that it seems to undermine the mission of hospitals. It seems to me that hospitals are charged with treating all patients, regardless of the causes of their injuries and that it is not the hospital's prerogative to determine the causes of the illness and force the companies responsible to pay for the treatment. These hospitals are themselves responsible for numerous deaths among their patients. The significant rates of hospital-acquired infections and other medical treatment-caused morbidity and mortality in Missouri hospitals has been documented. However, I don't see these hospitals arguing that they themselves should be held financially accountable for the treatment of those illnesses. I don't see these same Missouri hospitals offering to return the money paid to them for treatment of illnesses that were caused by these hospitals. Philip Morris also points out that some of these same hospitals have profited from the sale of cigarettes at their facilities. Yet they are not holding themselves financially responsible for their own contributions to these patients' illnesses. The day these hospitals admit that they have contributed to the illnesses and deaths of some of their patients and they agree to reimburse those patients for the costs of those mistakes is the day they can talk to me about seeking compensation from the tobacco companies. Until then, this is both a lawsuit without legal merit and an undermining of the mission of our hospitals.